Then, surprisingly and out of nothing, from that primordial void, two strange worlds arose: one made of fire and another one made of ice. These were worlds of opposite elements. They began expanding slowly but forcefully. Then, eventually, as both the worlds expanded sufficiently, they came into contact with one another, and a cosmic cataclysm occurred. During the cataclysmic event, blocks of massive frost and huge dense fog were formed as part of the ice had been liquefied. From the water which resulted, Ymir, the colossal father of the ice giants arose. His size was such that no man could ever conceive it. But even bigger than Ymir was the Auðumbla cow, which also came to life from the water. After Auðumbla fed Ymir, the giant was satiated, and he fell asleep and began to sweat. From Ymir’s left arm a man and a woman of the same species came into existence, which propagated the lineage of the ice giants. While this was happening, Auðumbla licked the salty frost rocks. Little by little, Auðumbla unearthing a human figure. Auðumbla had found Buri, the ancestor of the gods, who would have a son named Bor, who in turn would father Odin, Vili, and Ve. These three gods went to war with the ice giants, which they defeated, killing Ymir. With Ymir’s corpse, the Gods created the seas, the earth, and the sky. After the Gods finished their work, the universe was formed by nine worlds called Niflheim, Muspelheim, Asgard, Midgard, Jotunheim, Vanaheim, Alfheim, Svartalfheim, Helheim. 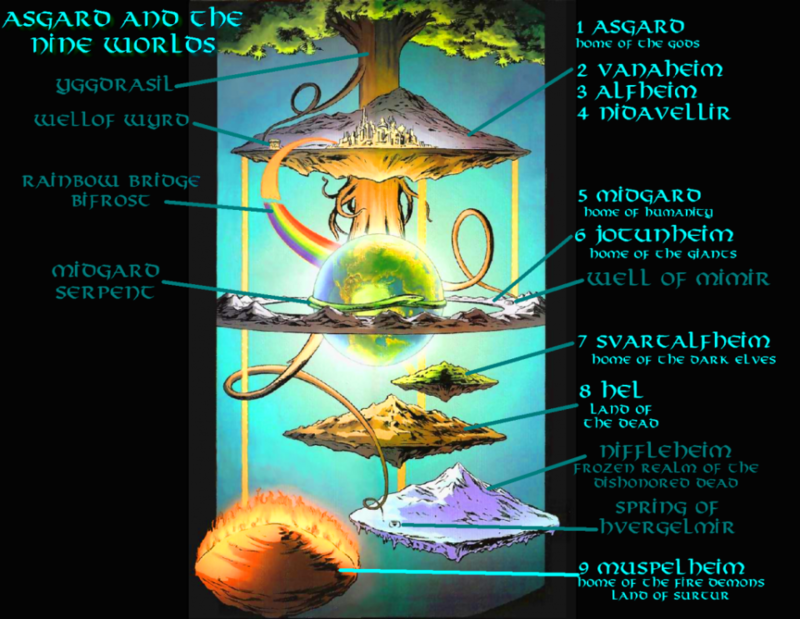 The nine worlds in Norse mythology are contained within the branches and roots of the world tree Yggdrasil. The first world according to Norse Mythology is Muspelheim: A world of fire whose heat is unbearable even for the gods. In Muspelheim the air burns. Muspelheim is the home of the fire giants, the most powerful of which, Surtur, watches Muspelheim ‘s entrance armed with a powerful flaming sword. Then we have Niflheim: a Solitary world of eternal ice, in it flows the fountain that feeds all the springs of the universe. Nilfheim is home to the frozen rivers of Élivágar and the well of Hvergelmir, from which come all the other rivers. The third world according to ancient Norse mythology is Midgard which literally means Middle Earth. Midgard is the world assigned to men, but where the dwarves also live. It is one of the Nine Worlds—the only one that is completely visible to mankind (the others may intersect with this visible realm but are mostly invisible). Midgard is located between the land of Niflheim—the land of ice—to the north and Muspelheim—the land of fire—to the south. Odin, Vili, and Ve created the first man and the first woman from two wooden trunks they found on a beach. Midgard has a round shape and is surrounded by a large ocean in which the great sea serpent Jörmungandr (Miðgarðsormr) lives, who is so huge that he encircles the world entirely, grasping his own tail. Midgard was also connected to Asgard, the home of the gods, by the Bifröst, the rainbow bridge, guarded by Heimdall. After Midgard, we have Asgard, the home of the Gods. Asgard is the homeplace of the gods who are ruled by the almighty Odin. Asgard is decorated with incredible, beautiful buildings among which we find Bliskirnir, the castle of Thor; the halls of Valhalla, where warriors who die in combat go; and Vingolf, the meeting place for the goddesses. A bridge in the shape of a flaming rainbow, the Bifröst, connects Asgard with the land of men. The god Heimdall watches over the Bifröst closely during day and night. After Asgard we have Jötunheim. This is the so-called World-prison in which the ice giants and stone giants live in seclusion. Impenetrable iron forests and wide rivers that never freeze prevent their escape. Vanaheimr is the world of the Vanir, a group of gods associated with fertility, wisdom, and the ability to see the future. Alfheim also called Ljosalfheim. It is located on Midgard and is home to the elves of light. Helheim is a place where all the dishonorable dead, thieves, murderers and those the Gods and Goddesses feel is not brave enough to go to Valhalla or Folkvangr. Hel rules Helheim. Helheim is a very grim and cold place, and any person who arrives here is a said to never feel joy and happiness again. Hel will use all the dead in her realm at Ragnarök to attack the Gods and Goddesses, which will be the end of the world. It is located under Midgard, and its center is occupied by Naastrand Island, on which rises a great torture chamber that awaits those who were vile during their lifetime. The Palermo Stone : Evidence of Ancient Astronauts ?